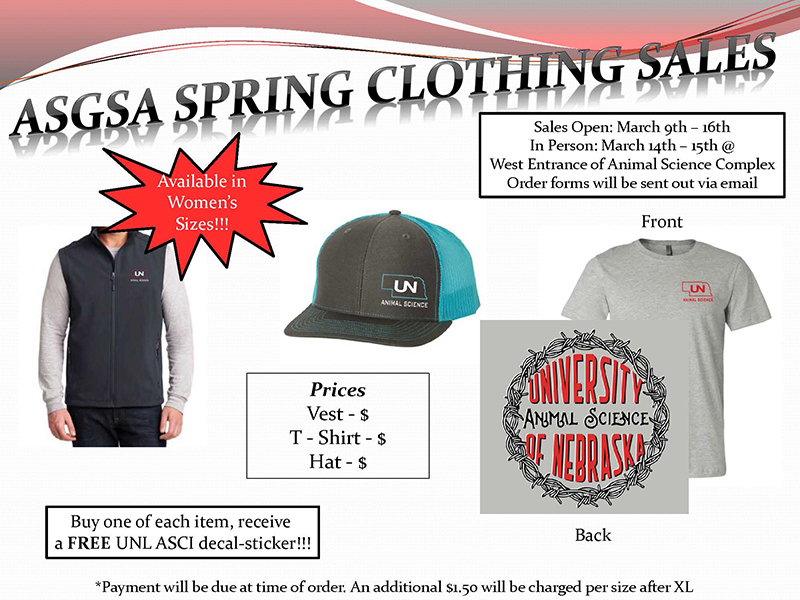 The Animal Science Graduate Student Association is having their annual Spring clothing sales this semester! This year, the organization is selling soft-shell vests, hats, and short sleeve t-shirts, pictured here. All proceeds from these sales go towards helping fund the graduate students' travel to conferences as well as other needs. 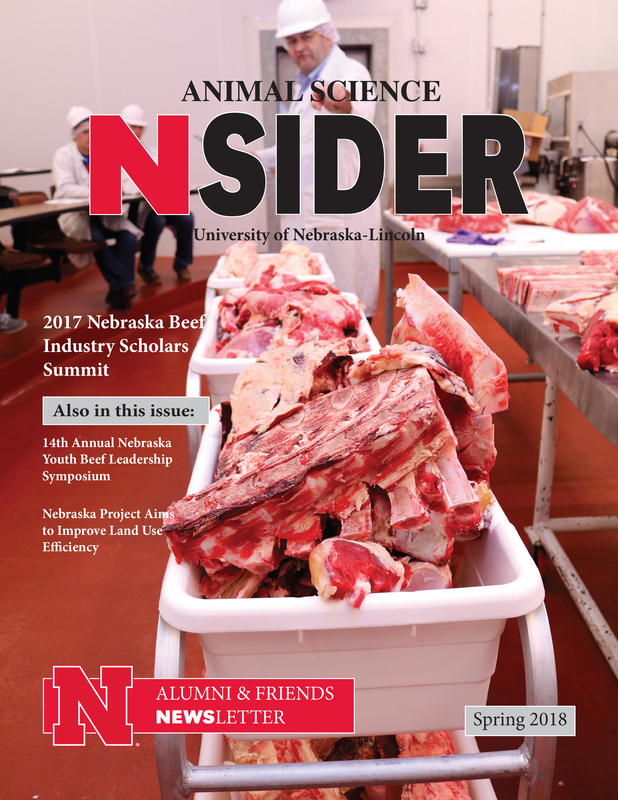 Welcome to the second edition of our departmental newsletter, the “Animal Science Nsider”. 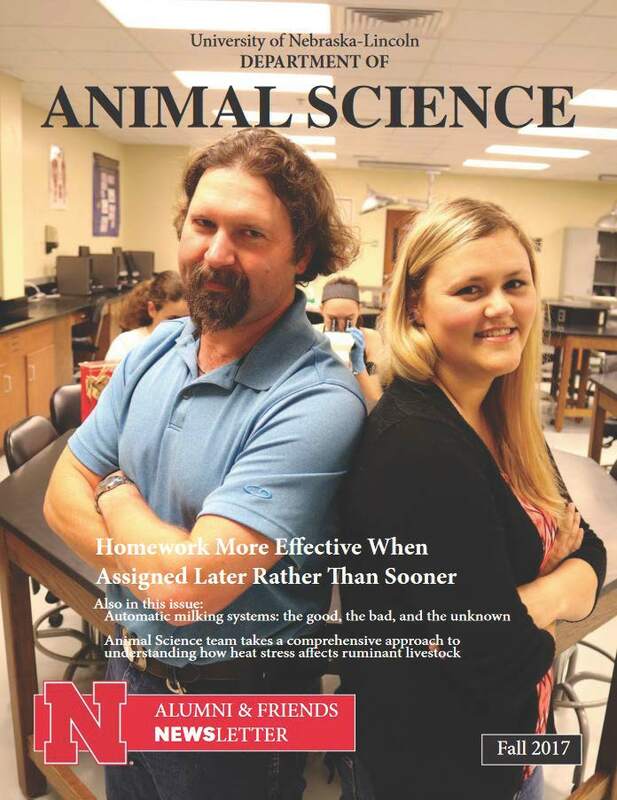 As I begin my second year in the Department of Animal Science at the University of Nebraska, I continue to be amazed at the talent and commitment to excellence of our faculty, staff, and students. We are pleased to share a few of the stories from the many wonderful activities and achievements which have occurred throughout the fall 2017 semester. We also want to make you aware of some upcoming events in the Department of Animal Science and hope that you will be able to participate. We are excited to present you with our first edition of the Department of Animal Science Alumni and Friends News. 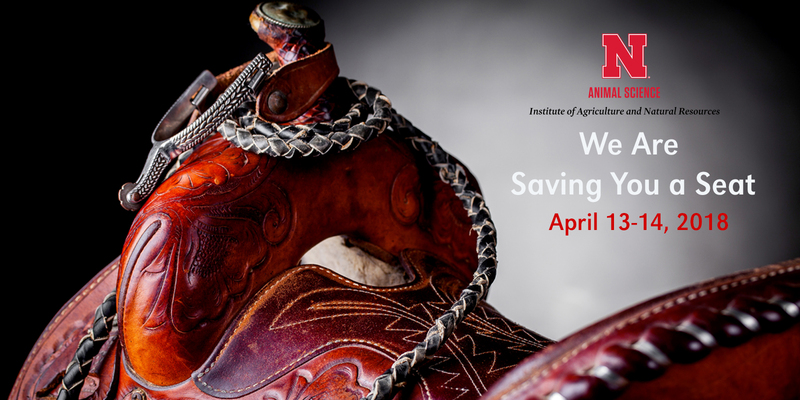 We are committed to keeping you informed about activities, successes, opportunities and upcoming events at the University of Nebraska, Department of Animal Science. We plan to send you the Alumni and Friends News each Fall and Spring. Our department has a strong and proud history of excellence in Teaching, Research, and Extension, and we are striving to become even better in the future. Jeffery Perkins, the ENREC Swine Unit Manager, was recently honored with the 2017 Omtvedt Servant Leader Award. This award recognizes staff members within the Institute of Agriculture and Natural Resources for their excellence, leadership and dedication. 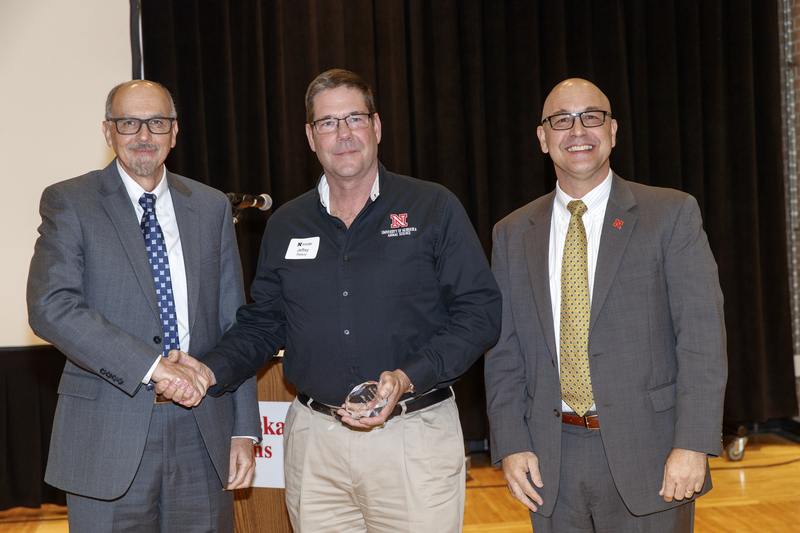 The Omtvedt Servant Leader Award was presented at the IANR Awards Luncheon held December 1 at the Nebraska East Union. The Beef Improvement Federation (BIF) presented Matt Spangler, Lincoln, Nebraska, a BIF Continuing Service Award June 2 during the group’s annual meeting and symposium in Athens, Georgia. Kathleen Anderson, Professor of Animal Science at the University of Nebraska-Lincoln, was recently honored with the Equine Science Society Fellow Award. The Fellow Award recognizes distinguished service to the horse industry and to ESS over a long period of time. The award was presented at the Equine Science Society awards banquet on June 2 during the Society's 25th Symposium in Minneapolis, Minnesota. Lincoln, Neb. — Eleven research universities, including the University of Nebraska­–Lincoln, are calling for stronger federal support of the food and agricultural sciences through a new report, Retaking the Field—Strengthening the Science of Farm and Food Production. 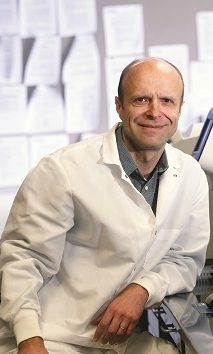 The report explores projects funded by the USDA National Institute of Food and Agriculture’s (NIFA) Agriculture and Food Research Initiative (AFRI) at each institution, including research from Daniel Ciobanu, associate professor in the Department of Animal Science. Lincoln, Neb. 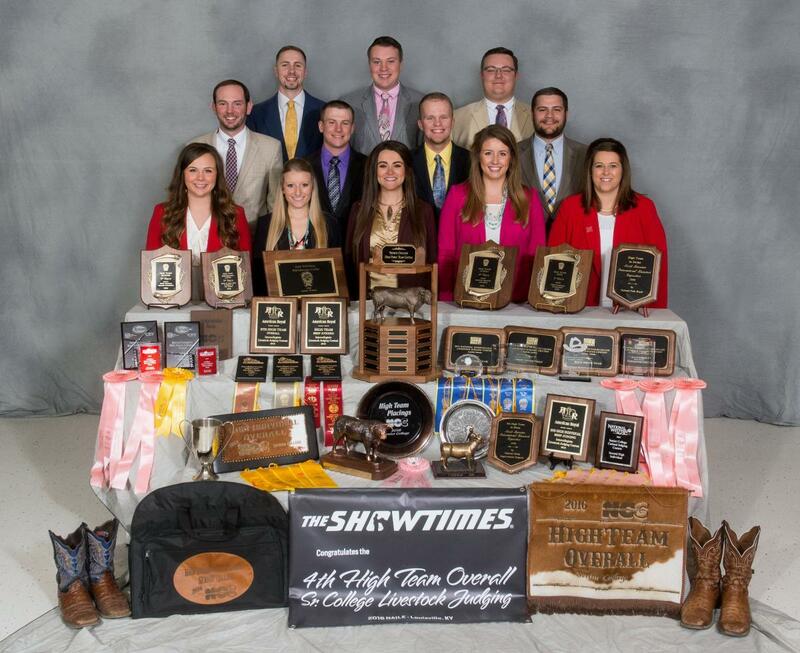 — The 2016 University of Nebraska–Lincoln Livestock Judging Team recently celebrated a very successful season. The team competed in 13 events against 30 different collegiate teams from across the country. A high note of the season was placing as the high team in cattle at the American Royal in Kansas City, Missouri, in October. This was the first time since 1976 that a team from the university has won cattle at this competition. Lincoln, Neb. — The University of Nebraska-Lincoln animal science department has appointed two new student ambassadors for the 2016-17 academic year. 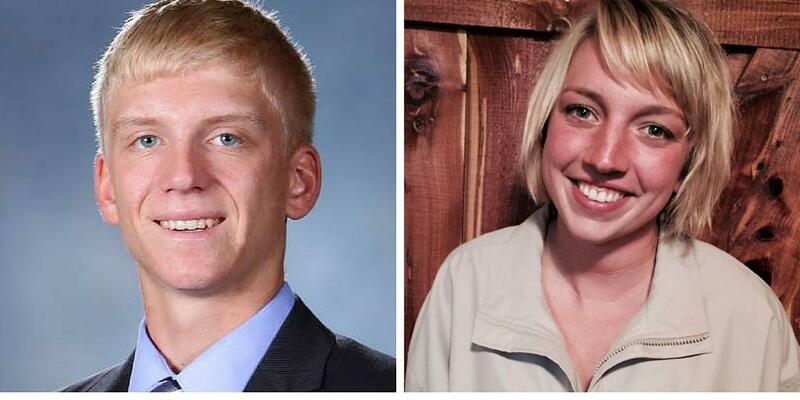 After interviews with department faculty and senior ambassadors, two students were selected from eight applicants: junior David Schuler of Bridgeport and junior Amanda Lambrecht of Kennard.